A story revolving around the second generation rich and second generation officials and the trials that they undergo to become military men. 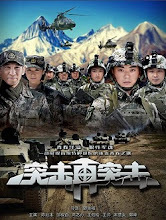 Liang Yong Jun (Chen Yue Mo), Si Wen Bin (Wang Shi) and Zhou Rui Qi (Zou Jun Bai) are three young military recruits who come from different backgrounds. As the assistant captain, Li Tie (Song Chu Yan) pretends to be armed and dangerous to give the boys the experience of real-life combat. Liang Yong Jun's reactive abilities do not go unnoticed and he is transferred to the recon team. Training is harsh and rigorous but not lacking in warmth as Liang Yong Jun gets reunited with his ex-girlfriend Lin Yu Qing (Gao Yi Dan) and also forms a bond with Si Wen Bin and Zhou Rui Qi. When it was time to put their skills to test, Liang Yong Jun suffers his first and biggest failure due to his own arrogance, and a wall of shame was erected as a reminder of his defeat. After hitting rock bottom, Liang Yong Jun and his comrades train even harder for the opportunity to prove themselves worthy of the uniform. Filming took place in Tibet, Yunnan, etc. Let us know why you like Tu Ji Zai Tu Ji in the comments section. Please also share these fun facts using the social media buttons below.